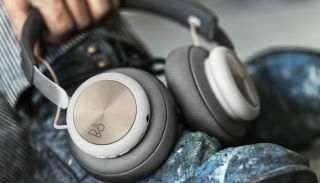 B&O Play launches new H4 wireless headphones | What Hi-Fi? The Beoplay H4 wireless headphones have a claimed 19-hour battery life, Bluetooth connectivity and memory foam ear cushions that aid passive noise-isolation. B&O Play has put a new pair of wireless headphones on the market, the Beoplay H4. MORE: The smartest noise-cancelling headphones in the world? Three buttons on the headphones' housing control audio playback and Bluetooth pairing. There's also a 3.5mm jack input and a Micro USB connector for charging. B&O claims the battery will power the headphones for up to 19 hours on a charge of a little under three hours. The Beoplay H4 headphones come in Charcoal Grey and cost £250. They are available in Bang & Olufsen stores and online from today.